When Windows Plug and Play detects my dongle, it identifies the device as BCM92035DGROM. Now I had previously had success on XP SP2 by modifying bth.inf in C:\Windows\inf, and merely adding a line with the device ID reported by the device manager. (This information was provided by a blog post that I managed to find by searching on the device name). After trying numerous times to get Windows to recognize my device, I decided, in sheer desparation, to simply go for the closest match listed in the Broadcom section of the bth.inf file, when looking through all devices in the driver database. 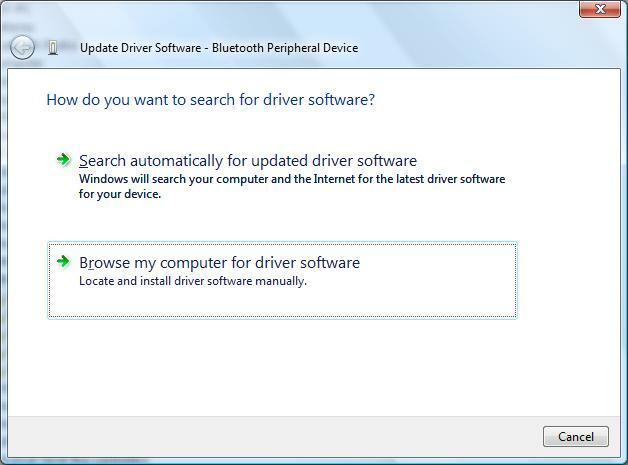 This option came up only when right-clicking on the device in the device manager and choosing Update Driver Software… and choosing “Browse my computer for driver software”. 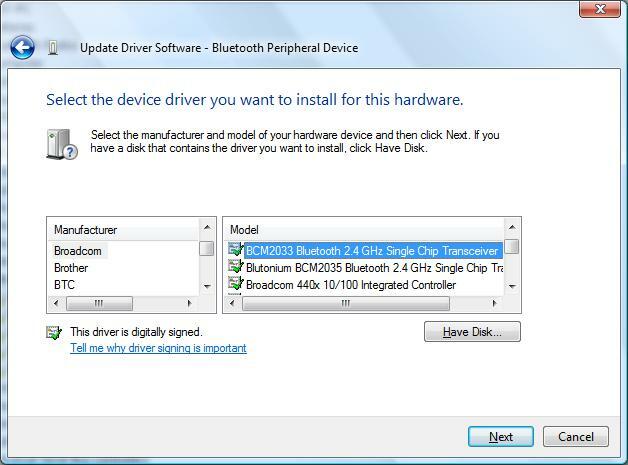 On the following dialog, I chose the “Let me pick from a list of device drivers on my computer” option, which didn’t appear in the usual Plug and Play wizard. After that, I chose All Devices and clicked “Next”, from where I could select Broadcom as the manufacturer, and BCM2033 as the device. Although not the same device, I was able to send files from my laptop to my phone, which is all that I really wanted. I subsequently ended up with a whole lot of unrecognized hardware in my device manager, but that’s not my worry for now. The moral of the story is, if I had to guess, that one should be careful of these no-name brand devices, and at least make sure that you get an install disc with it, or don’t misplace it if you do have one. This entry was posted on Monday, November 16th, 2009 at 11:43 pm and is filed under Comment, General. You can follow any responses to this entry through the RSS 2.0 feed. You can leave a response, or trackback from your own site.